The identity of the Arnsberg municipal works is inseparable with the concept of water. After all, water supply for the inhabitants is one of the essential services of the communal company. The architecture of Campus Arnsberg, the name of the new municipal authority headquarters, reflects this in the most emotional way – in the glazed design of the facade reflecting the purity of H2O, the large water feature at the entrance and blue accent lighting illuminating the building and outdoor areas. TRILUX Lutera 100 ground-recessed LED spotlights emphasise the striking look of the campus. Their blue light transforms the transparent structure of the fenestrated entrance area into a portal washed in blue. The generously dimensioned fountain area in front of the Campus is displayed in a similar way. Lutera LED spotlights have been installed directly adjacent to the small fountain jets, bathing the slender columns of water from below in blue light – an eye-catcher creating an attractive atmosphere of light particularly at night. The Campus is not only open in terms of architecture but also open to external users. The glazed entrance area and seminar rooms can be reserved for use by other municipal facilities, companies, clubs and associations. The multifunctional appeal of the areas along with their adaptable lighting concepts also provides a professional backdrop for exhibitions, meetings, training events and seminars. Special importance was placed on the cost-efficiency of all systems used. For this reason a uniform LED solution was a must-have. "We hit the nail on the head in terms of low maintenance costs and energy overheads," stated Campus coordinator Jan-Eric Hunecke. Mirona QL LED can be specified as being exemplary in this respect – this luminaire has been installed in the entrance area and provides high quality of light, good luminous efficiency with low power consumption. The LED spotlight is also capable of genuine marathon performances with a service life of up to 100,000 operating hours. 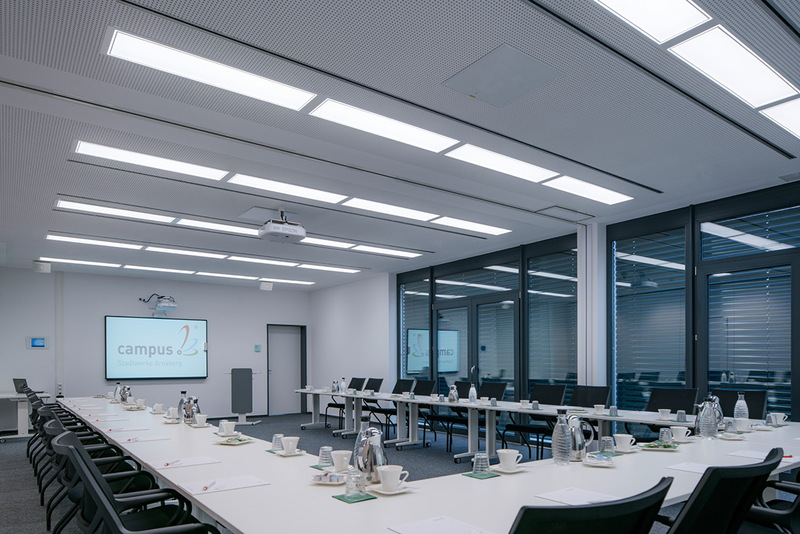 Convenient: individual adaptation of LED lighting in the seminar rooms thanks to the light management system. Functional: Mirona QL LED creates uniform light comfort in the transparently designed entrance hall. 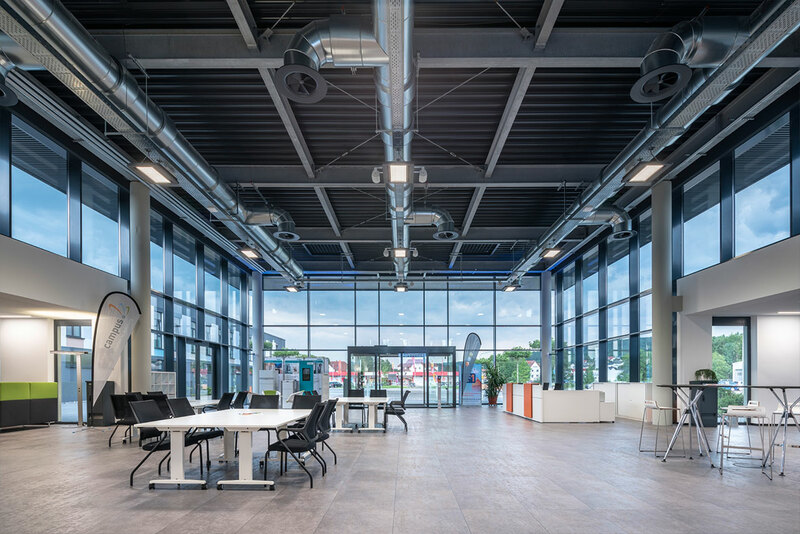 A high-performance light management system was needed to further optimise efficiency and light comfort – the solution specified was LiveLink. Thanks to this system a further 30% of energy is saved in the seminar rooms via daylight and occupancy control. Adaptable light was needed here as well because both rooms can be combined to create a large hall. Various pre-programmed light atmospheres can be called with just a few clicks. "Control via an app is very convenient if, for example, we want to dim the light during presentations," explained Jan-Eric Hunecke. 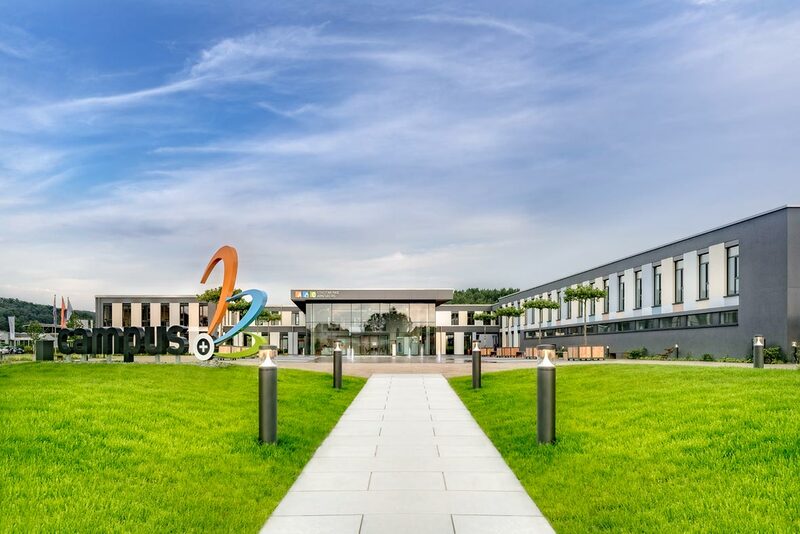 In summary, Campus Arnsberg is a successful example of multifunctional architecture in combination with energy efficiency, sustainability and lighting that reflects identity. "We needed a strong industry partner for that," stated Hunecke. "With TRILUX there to help us we could ideally achieve our target of an efficient and high-impact building construction." Sustainable: efficient TRILUX LED technology for the outdoor areas at Campus Arnsberg.